At The Carpet Shop customers to understand what we do and how we do it, and we always explain why we do it also. Hardwood floors come in a number of different varieties and there is a manufacturing process involved in creating them. We don't simply chop down the trees and cut them into wooden planks. It's more complex than that. Hopefully, this page will give you some insight into how a hardwood floor is manufactured and why they are so durable and valuable to a homeowner. Sizes, Species and Types: To begin with, there are different size hardwood floors. When we say "size" we are referring to the width and length of the boards that it's constructed of. A "solid" wood floor is typically made of ¾" thick plank which is 2 ¼" wide. "Classic" strip wood floors are made up of random lengths anywhere from 12" to 84". The most common species of wood used for either are red oak, white oak, cherry, maple, white ash, hickory, or pecan. 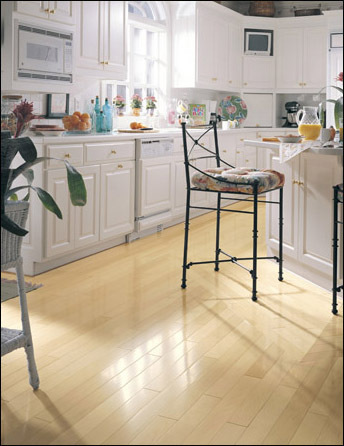 There are three standard types of hardwood floors: Engineered, Solid and Longstrip. Unique Flooring offers all of them. Engineered Hardwood Floors: Engineered hardwood is made from thin sheets that are laminated and glued together to form a single plank. They are usually stacked in opposite directions to provide more strength, a procedure called cross-ply construction. Engineered hardwood is perhaps the most versatile of the three standard types. It can be glued, nailed, stapled or floated, is resistant to moisture, and can be installed over concrete slabs. You can also manufacture more widths and lengths. Solid Hardwood Floors: Almost the complete opposite of engineered hardwood, solid hardwood is made from solid pieces with tongue and groove sides. It's sensitive to moisture and is not recommended for installation over a concrete slab or below ground level. Since it's a natural product, it will expand and contract with seasonal changes. When installing a solid hardwood floor, it's important to leave expansion room around the perimeter, particular in regions where there are seasonal climate changes. 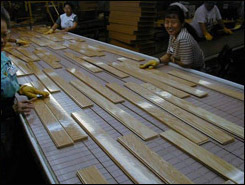 Longstrip Hardwood Floors: Longstrip hardwood floors are made from several wood plies glued together, similar to engineered hardwood. The top layer is made from smaller individual pieces and the center core is softer and more pliable. Longstrip floors are versatile and can be installed over concrete or almost any other surface, making them ideal for situations where the floor needs to be assembled and disassembled. They also make a great addition to a home or office. If you have additional questions on the manufacture, methods of assembly and construction, or recommended uses of any of these hardwood floors, please contact one of our experienced floor technicians at Unique Flooring any time. We have done a number of each over the years and would be happy to show you photos and provide pricing and references to help you make your final decision about which hardwood floor you would like in your home.